The Santos Nutrisantos N65 is equipped with a 650-watt induction motor which provides abundant torque for the massive stainless steel auger to press everything from fruits to root vegetables to leafy greens. The cold-press system preserves the vital nutrients and vitamins in the juice while providing the highest juice yield. Compared to centrifugal juicers, the yield is higher, nutrition is much better, and oxidation is practically eliminated. This means no more foamy juice turning brown in a few minutes. Juice naturally tastes fresher and better. The anodized cast-aluminum construction, heavy-duty parts, and low speed motor make this an exceptionally durable machine. And the stainless steel juicing parts (bowl, screen, auger, feeding tube) make it exceptionally hygienic as well. Unlike noisy high-rpm centrifugal juicers, the Santos N65's low speed motor is quiet. You can carry on a normal conversation while it is running, allowing a more comfortable environment for both customers and employees. And the stainless steel juicing parts clean up easily. Just rinse them under running water in most cases, and scrub the juicing screen with the included brush. In addition, all the juicing parts are dishwasher-safe when deeper cleaning is needed. Operating the N65 is simple - just turn it on and adjust the speed according to the produce you are juicing. The extra-wide 79.5-mm stainless steel feeding chute lets you process whole fruits and vegetables easily. The upper dial controls how quickly the produce enters the juicing chamber, and the lower dial controls the juice extraction speed. The auto-reverse feature prevents jamming. 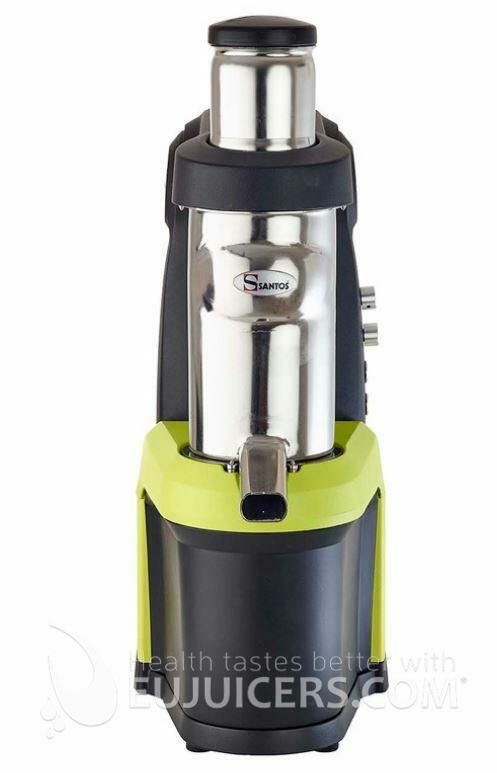 The extra large 4-liter pulp container is integrated under the juicing assembly, and slides out for easy emptying. Since the pulp is expelled directly down from the juicing chamber, there is no pulp chute to clog or complicated gear drive to break. Assembly is fast since there are few parts. 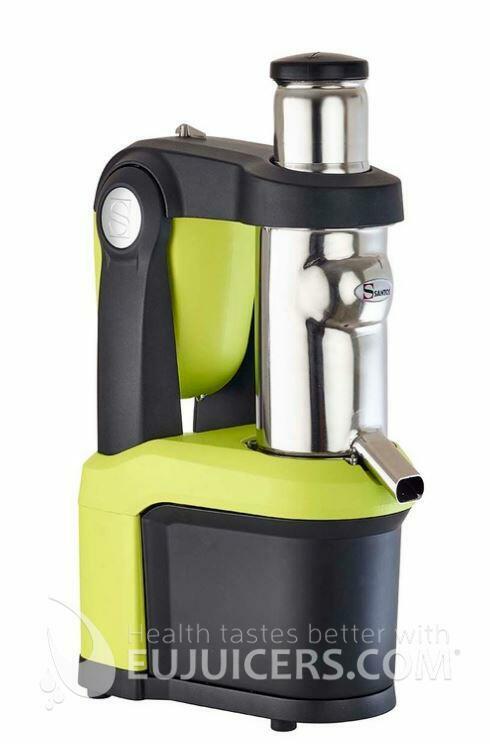 The upper arm pivots up to allow easy removal of the juicing assembly. The Santos N65 represents a big step forward in commercial juicers. 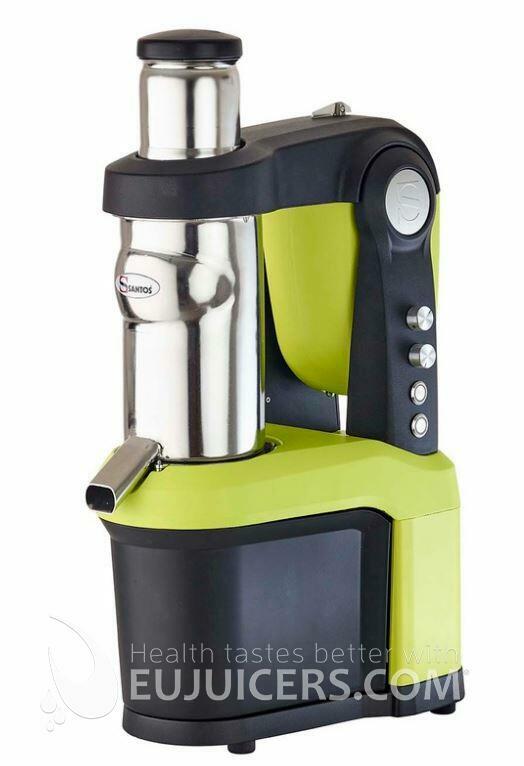 With its heavy-duty cast aluminum construction and solid stainless steel juicing parts, it is built like a tank. But what impressed us even more was the speed and effortless way it produced high-quality juice. The variable speed control was a useful feature, as the higher speeds produced juice really quickly (a liter in 90 seconds from apples) and the lower speeds produced slightly higher yield (approximately 10% more). The juice was consistently of fine quality, far better than what is achieved from commercial centrifugal juicers, especially for leafy greens. And since it is slow-pressed, the juice can be stored far longer. Cleanup was fast, since the stainless steel juicing parts just needed to be rinsed off. We also liked the large integrated pulp container, and the clean way the pulp was directly ejected downward. 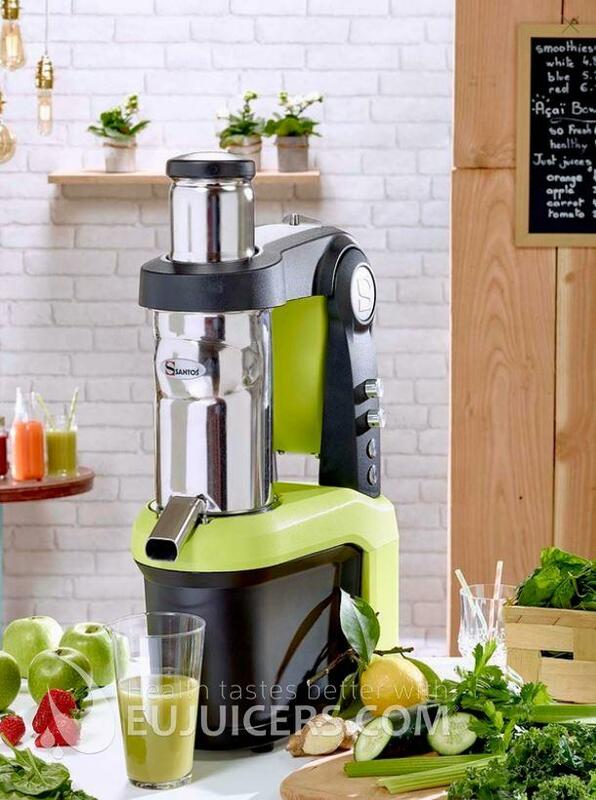 The N65 seems to hit that "holy grail" of fast juice production like a centrifugal juicer with the high quality, taste, and yield of a cold press juicer.